I was looking for a small project to help get into Zend Framework and while talking to Dave Marshall he invited me to help with his Php Job Board, PHPPositions. PHPPositions UK is a simple job board, listing genuine PHP jobs, for genuine companies. No agencies. I found myself in a little too deep, but did manage a small amount of work on the RSS feed. In the end I decided that I need a better grasp of the ZF and picked up “A Guide to Programming with Zend Framework“, by Cal Evans. I’m only 4 chapters in but so far it’s been good. I’ll perhaps write a proper review when I’m done (hopefully before ZF 1.7 is released). Only 18 more sleeps until my first Php conference. It’s a 1 day conference, held in Manchester. Very handy for someone living in Market Rasen, Lincolnshire. The conference is ran by PHP North West. phpnw08 is a 1 day conference, to be held on Saturday 22nd November 2008, for developers, designers, managers or anyone else with an interest in the PHP programming language. The schedule is looking really good, especially as this is PHP NW’s first conference. My schedule looks to include, First Steps with Zend Framework with Rob Allen, Index and Search, options for PHP programmers with Zoe Slattery and The Power of Refactoring with Stefan Koopmanschap. You might see me milling about with some work colleagues, including Dave Marshall. We are in Manchester for the best part of the weekend. Should be a cracking time. Welcome to my blog, I was hoping to run my own WordPress blog, shamefully I haven’t found the time, at least this way I can start blogging now. I have a few posts in draft covering the PHP NW 08 conference (which I will be attending). A Php UK Job board, PHP Positions. 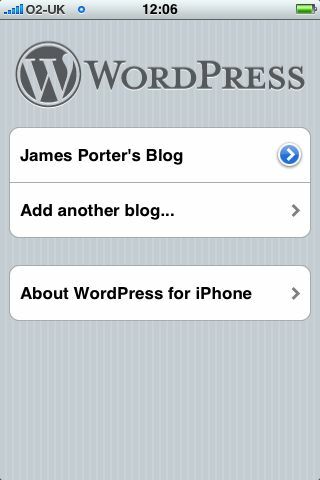 Plus the WordPress’ Iphone app which I discovered while creating this blog.